Data Flow Task Name:Error: Microsoft.Ssdqs.Infra.Exceptions.EntryPointException: The Knowledge Base does not exist [Id : 1000999]. 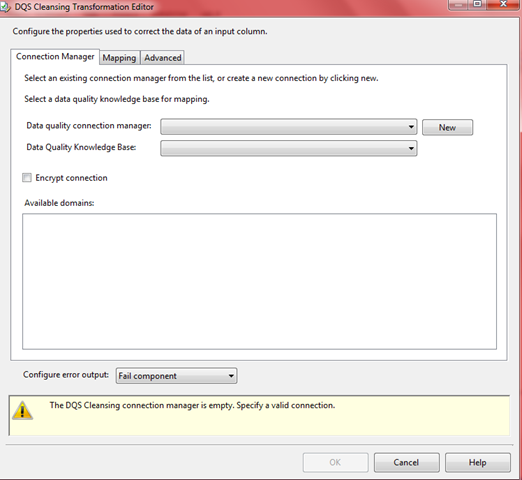 Data Flow Task Name:Error: System.NullReferenceException: Object reference not set to an instance of an object. 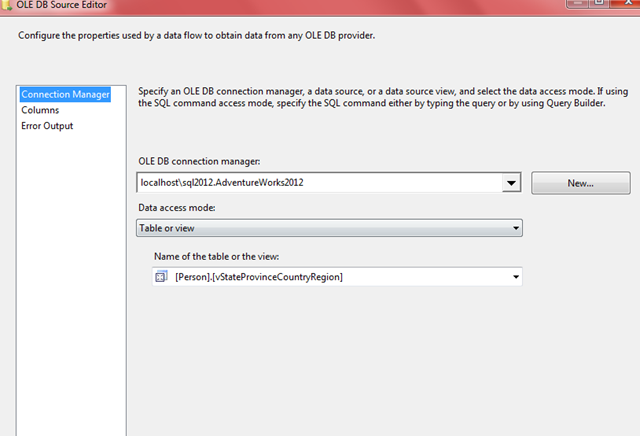 Option 1: Manually open the package in the destination server within data tools to force the knowlegebase_id to refresh. NOTE: Since I don’t know many shops that generally try to make it a habit of opening things for refreshes in production, I’m just going to disqualify this one and move on. Option 2: View the xml code of the package, and change the knowledgebase_id manually on the package to get it to look to the right knowledgebase. This will return the maximum ID for the corresponding knowledgebase you’re looking for. 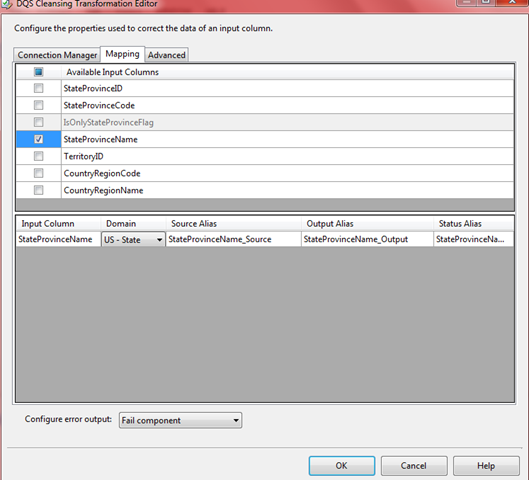 We can then use this value by changing the value inline in the SSIS package XML tags. Locate the SSIS package that is calling the knowledge base in the file system, and right click on it, and open it with your favorite XML editor. Once we open it, we’re looking for the line indicating the knowledgebase name, which we want to replace with the number that we returned in our query. 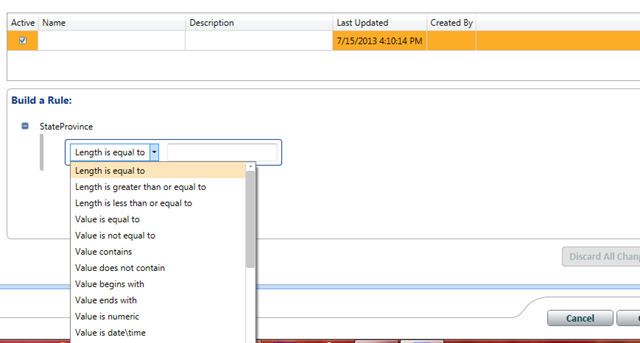 Again, though, we have the same issue as in Option 1 where we need to manually edit things in production. Option 3: This solution makes the most sense to me, but it’s a definite shift from the general way we’re used to doing things in IT (and development in general). Remember that, at its core, DQS is designed to be a product used by an end user. It is, in actuality, a tool that a business analyst can (and should) use to create rules around their data, that we as developers consume. The concept of development and production, in this case, almost seem as though they should all be done in the same step, allowing the analyst to preview and analyze before they do the initial publish. If there is 1 knowledgebase that everything points to and is maintained by the analyst, we don’t have to worry about deploying DQS databases across environments as well. Additionally, DQS is such a new product that just teaching someone the basics of what they can do with it is enough, teaching a business analyst the ins and outs of deployment processes seems unnecessary. Visually, this approach looks like the below. Having one knowledgebase maintained by the user allows all ETL processes, whether dev, test, production, or whatever the ability to all read from the same knowledgebase. 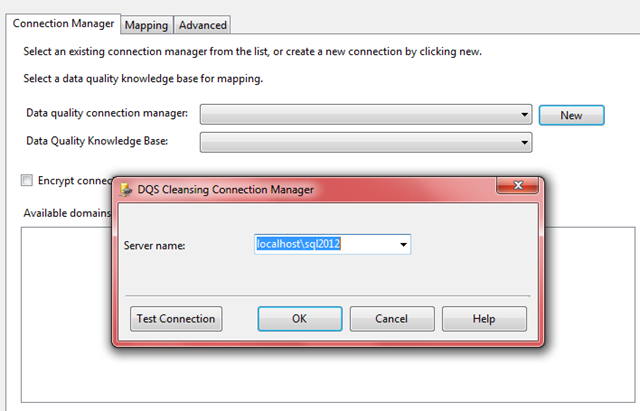 Doing this prevents this error from occurring, as no matter how many times our users updated the knowledgebase, all SSIS packages will always pull from the most recent knowledge base ID, as they will always be querying the same A_KNOWLEDGEBASE table located in the DQS_MAIN database. 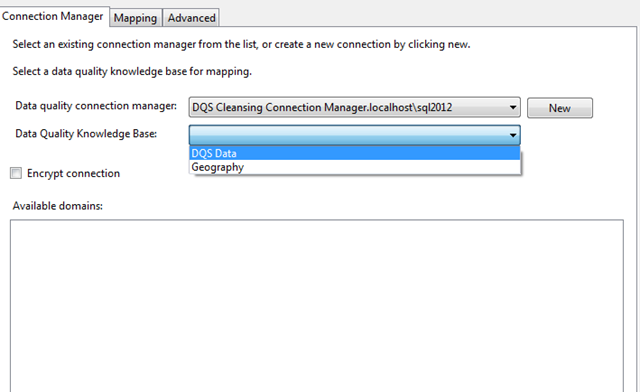 In my opinion, one of the coolest features in DQS is the ability to consume information from an Azure data set. 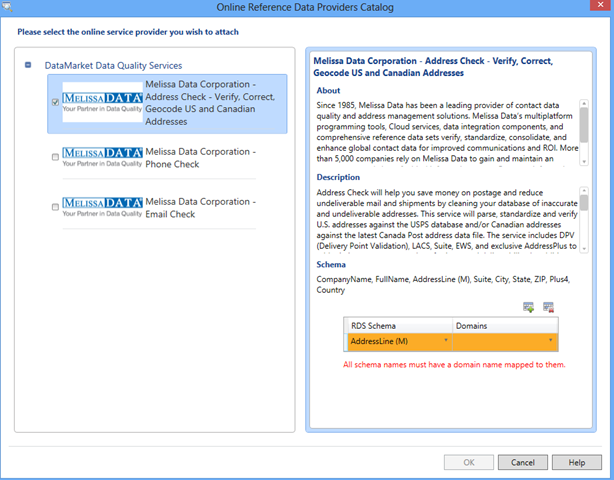 Not surprisingly, one of the biggest providers of data sets for DQS on Azure is MelissaData, which has been around for years in the data quality arena and has some awesome features that you can purchase. Even better, with the Azure datamarket, some of the bigger, more common data quality pieces can be tried and demo’d for free. There are DQS API’s in the data market for US & Canadian addresses, phone numbers, ip addresses, name check, and Email check. The best part about these The big question is, when creating a domain in a knowledge base, how can we consume some of these to use against our data set? We’ll leave the auto correct threshold at the default for now. Click Finish to publish the knowledge base. Data Quality Services exists to manage the quality of the data being entered into your data warehouse (or other database). One of the main principles of DQS is the concept of domains, which, if you’ve implemented a master data management strategy before, you would be familiar with. For the rest of us data professionals (me included :)), this is a new concept that we need to understand if we want to use DQS appropriately. There are two main types of domains that we should be familiar with and be able to correctly create and utilize: simple and composite domains. During the rest of this post, I intend to cover the two types in depth, including creating and consuming them. Import your excel workbook. NOTE: Make sure your workbook is .xls, not .xlsx. 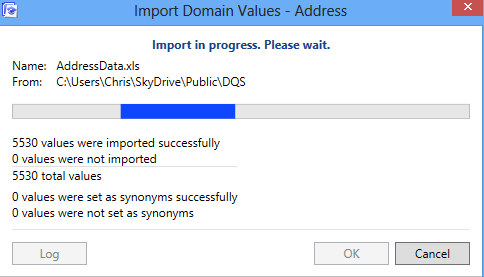 DQS does not support xlsx files at this time. 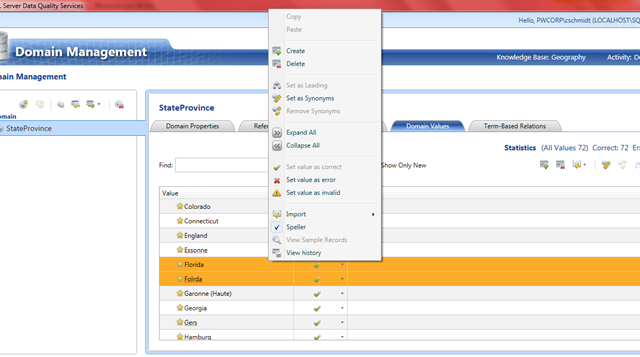 Once complete, click OK, and return to the Domain Values screen. The list of all the addresses has been imported into our domain for consumption. Once this is published we can consume and check this list to make sure any address being input is correct. Create a new domain for City, repeating the same steps as above and importing just the City names. Then do the same thing for State and Country. Once complete, you should have 4 individual domains for each part of the address. Composite domains give us even more control over our individual domains by allowing us to relate domains together. We can do things like add reference services from Azure (address, for example), create cross-domains rules, and add some more flexibility into our solution. 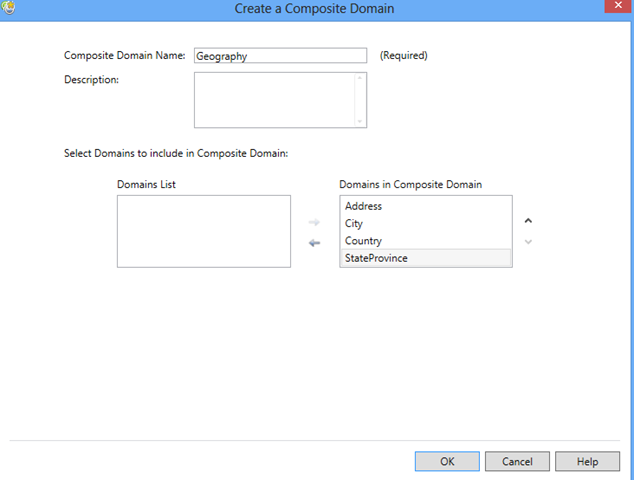 The composite domain dialog box appears, and we then need to configure our single domains appropriately. In the screenshot below I’ve titled it Geography, and moved over all of the single domains into a new combined composite. Once you click OK, you then have a composite domain that you can use against the data coming in. By adding a matching policy or knowledge discovery to the domain, we can start inferring and combining data and records that belong together, even though they come from multiple source systems. In addition to actually creating and adding knowledge bases, one of the biggest benefits of Data Quality Services is actually getting to integrate published Data Quality projects into your enterprise data management solution. One of my favorite features in particular about DQS is the control that it gives the business over the logic. Once your business user creates their DQS knowledge base, however, the next step is to actually integrate. 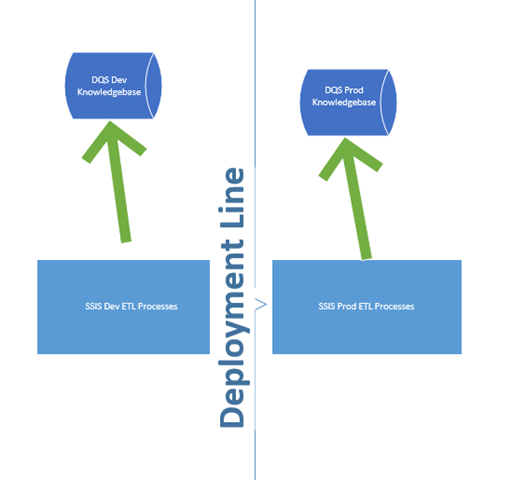 The DQS Cleansing component in SSIS allows us to do that integration into our ETL process, and it’s pretty simple to set up in SSIS. 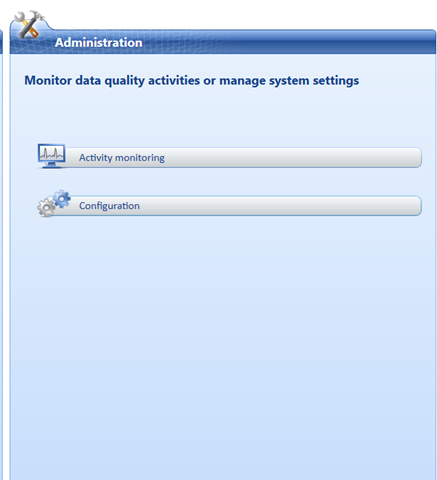 Connect to the DQS instance of SQL server that you have installed, by clicking on the New button under Data Quality connection manager, and type in the server name in the pop up window. Select the Data Quality Knowledge base that you want to connect to. Every DQS knowledge base that is published is accessible through this link. Click on the mapping tab, and then check the box next to the State-Province name field. 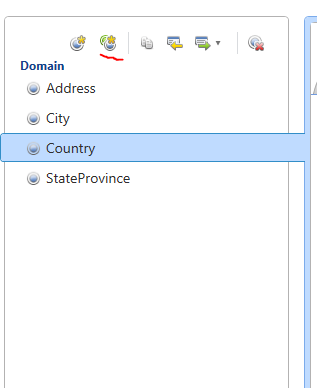 Under the dropdown in the Domain column, select US-State here, as we’re mapping the State Province name to the US State domain in DQS. 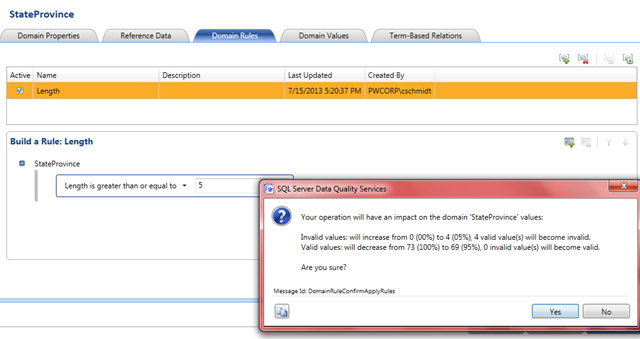 Suggested: the data was wrong, but it was *close* to a correct value, and DQS thinks that this value can be corrected. According to Microsoft, the best practice approach is to have a conditional split directly under this component, to output each of the different record statuses down varying outputs. This is referenced via the following blog article here. 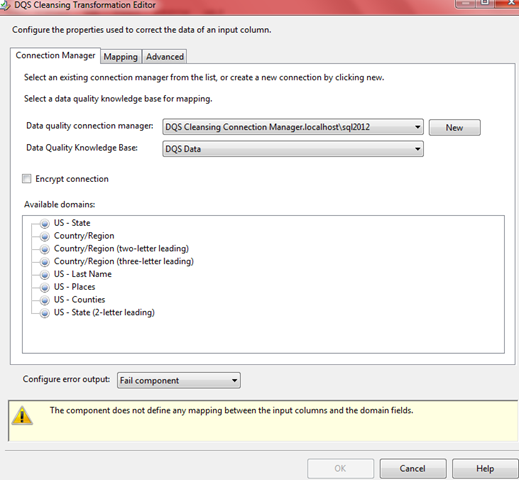 The actual Data Quality work is done on the Data Quality server, NOT the SSIS server. This means that if you are running your package on Server A, and the DQS server is installed on Server B, each row that comes through is sent to the Data Quality server on Server B for completion. 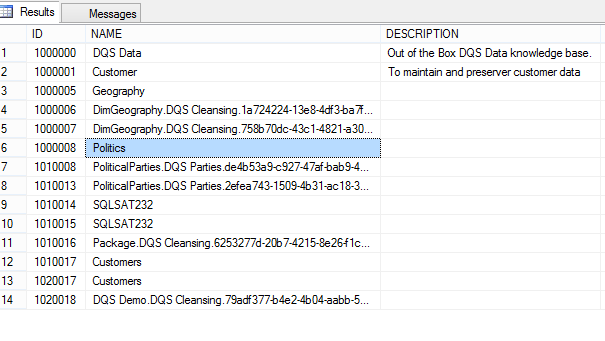 The actual data quality component is really very little more than a client served on the SSIS server. This will also affect performance greatly! I’m sure there is a lot more that can be done in DQS, and I am really looking forward to doing some more digging around this component! Pretty straight-forward so far. Now what we want to do is use this list as a master list of all of the states or provinces that we do business in. This way if we get invalid records, rather than marking them as unknown or inferred we can ensure that they are sent to the proper individual (the data steward) to be handled appropriately. Create a new knowledgebase by clicking on the “New Knowledge Base” in the top left hand corner. Give your knowledge base a name, a description, and select what type of knowledge base it should be. There are 3 activities listed, Domain Management, Knowledge discovery, and Matching Policy. Domain management allows you to create a new domain from a blank canvas, knowledge discovery lets you test against an existing dataset, and matching policy lets you either a) identify duplicate records, or b) identify related records. I’m going to use a domain management knowledge base, and I’m going to call it geography. 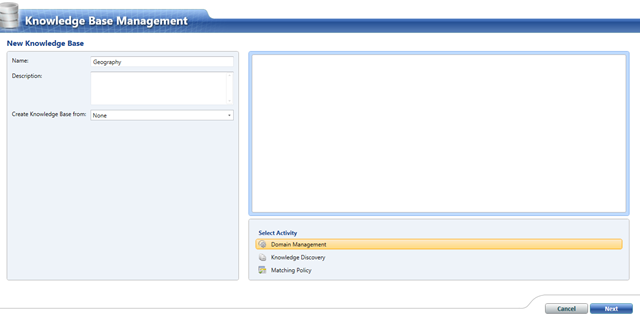 Click Next, and the Domain Management window appears. Domains in data quality services are very similar to columns in a relational database, just with a defined list of attributes of what is available. I remember it by thinking SELECT DISTINCT, where the list of rows returned is what your attributes should be. For now, let’s create one. 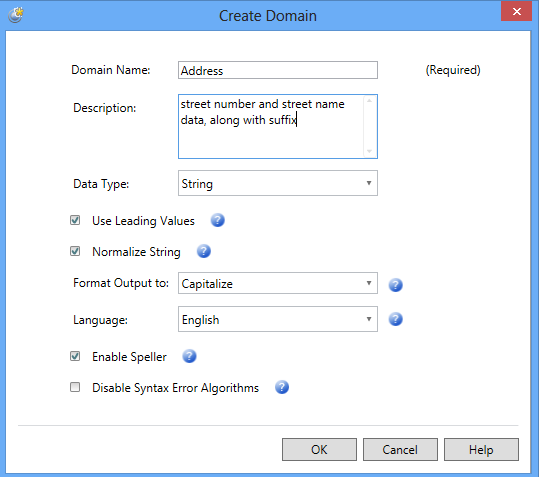 Click the “Create a new domain” button and the Create Domain dialog box appears. The first tab, Domain Properties, is identical to the tab we just configured. This is useful if after creating the domain, we decide we want to change the output or adjust some of the other properties that we’ve already set. The second tab that we have is a reference data tab. If you have an Azure DataMarket account or want to use an online repository to manage the data set, you can create and configure it in this screen. Once you set them as synonyms’, DQS maps the two together. Notice that Folrda has now been set to correct any rows to Florida. 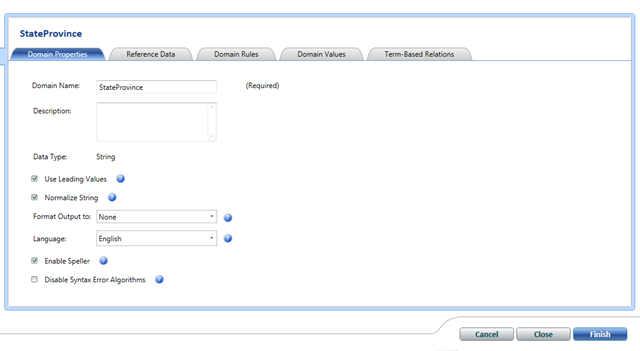 Go back to the Domain rules tab, and let’s create a domain rule. 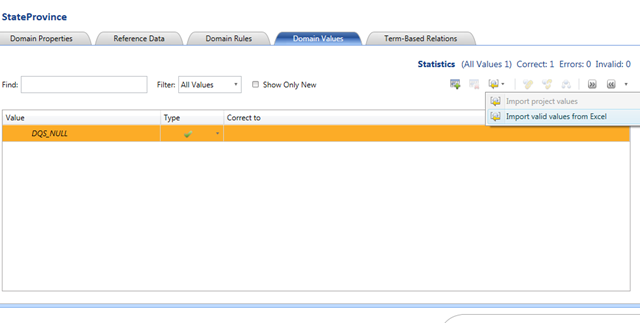 Click on the add a Domain rule icon. Click yes, and then click Ok. Then click Finish, and Publish. The knowledge base is created and published. 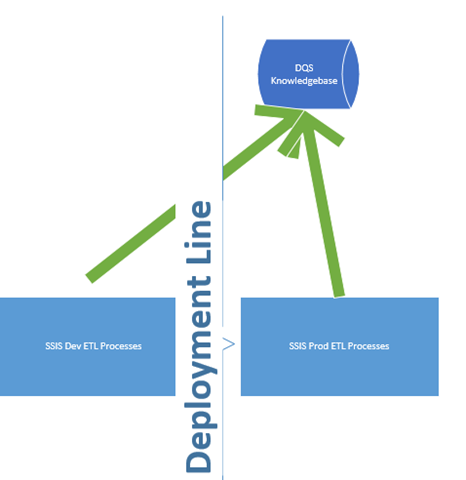 In a future blog post I’ll show how to use SSIS to consume the published knowledge base in an ETL design to help load your data into your data warehouse.